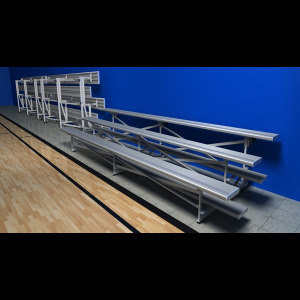 Sturdisteel Tilt & Roll Portable Bleachers are the answer for an unexpected overflow of crowds. Our three row units stack neatly against the wall and are tilted down to provide extra seating for spectators. Sturdisteel Tilt & Roll Portable Bleachers are the answer for an unexpected overflow of crowds. Our three row units stack neatly against the wall and are tilted down to provide extra seating for spectators. Tilt & Roll portable bleachers are designed with non-marking rubber pads for tilting and large swivel casters for portability without damage to floors. Anodized Aluminum seat board - mill finish aluminum footboards.